Basic Peru Tour in 4 Days: Lima, Cusco, Machu Picchu And More! This article was posted on Sunday, August 5th, 2018 at 2:15 pm and is filed under Tours of Peru. There’s so much to do when traveling in Peru, it can be hard to do it all when you’re on a quick vacation. The Best Peru Tours team has created a special 4 day tour so you can enjoy your trip to Peru, no matter how long your stay is. This tour covers Lima, Cusco and Machu Picchu. We are a U.S.-based tourism and travel agency that offers all-inclusive tours and Peru vacation packages with airfare within the country. These are some of the best Peru travel deals to tours that include Argentina vacation packages, Bolivia, and cities such as Buenos Aires and Rio de Janeiro. Our agency provides travelers with the best opportunities for exploration and adventure in the region. 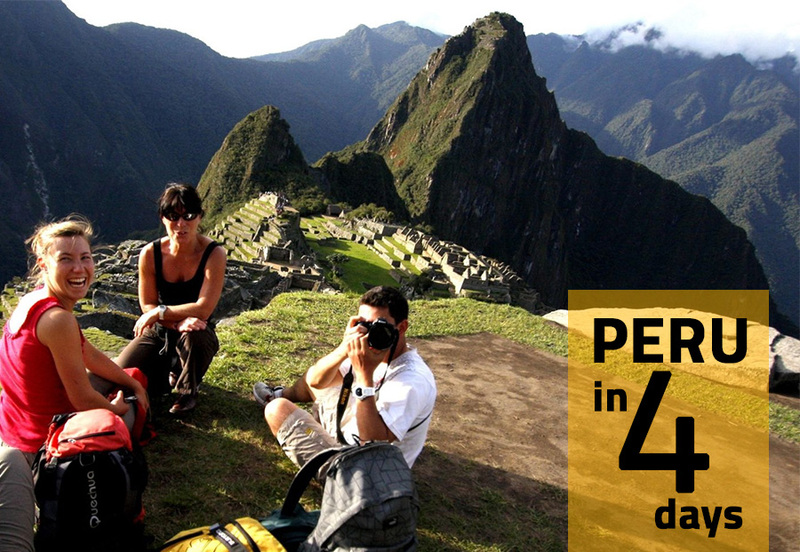 What would one of the best Peru tour companies offer in 4 days? Plenty! The first day starts with your arrival in Lima. You’ll be given time to unwind at your hotel and spend the night in Peru’s capital and largest city, Lima. There may even be some time to explore if you’re up to it. Make sure to get enough sleep because Day 2 starts early with breakfast at the hotel before you fly to Cusco and check into your next hotel. On Day 3, you’ll embark on a day trip by train and bus to Machu Picchu Citadel, the “Lost City of the Inca” in the Amazon jungle. A guided tour will cover the Main Plaza, Sacred Solar Clock and Circular Tower among other highlights of these beautiful Inca ruins. There will be plenty of time to enjoy the natural beauty of the site before you return for lunch to Aguas Caliente. By nightfall, you’ll be back at your hotel in Cusco to rest after a long day. Finally, you’ll fly back to Lima the next day where the tour will leave you feeling satisfied, but wanting more. The price per person includes flights within Peru, hotel accommodations, entrance fees, train fare, meals, travel guides and personal assistance. Included with each trip is cancellation and interruption insurance up to a specified amount. Emergency medical/dental coverage, medical transportation, and baggage coverage are included as well should the need arise. Best of all, Best Peru Tours donates 2% of sales proceeds to social support projects Kusicuy Children’s Fund and South America Change Inc. All while offering great Peru trip deals! Now you can travel and make a difference in the world all at the same time. Continue here for make your reservation. Our travel agents are glad to give you all assistance your need. Leave the work to us and enjoy your trip. You can purchase Peru and Argentina trip deals with PayPal Credit or via MasterCard, Visa, or American Express. Last minute trips are available, but keep in mind that flexible payment options are offered for those booked two months or more in advance. Purchase Peru vacation packages via the Shopify Secure site. All-inclusive Peru travel deals are just a few clicks away. Don’t wait! Make your purchase here. To read a certified Peru vacation review from any of our satisfied travelers, visit the link provided and make your purchase at https://www.bestperutours.shop. For more information, you can call us at 1-866-788-5647 in the USA and Canada or contact Best Peru Tours online by emailing us at [email protected].